I'm Kiran and I'm the delivery manager for the HMRC transition project. I manage the workload and resources of the team and remove any barriers to successful delivery. 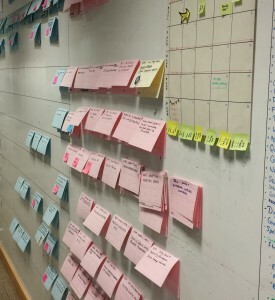 Anyone visiting the GDS offices will notice that there's very little wall space - that's because they're all covered in post-it notes, drawings, index cards and other kinds of visual aid. Instead of keeping ideas, plans and work-in-progress in documents, Gantt charts and emails, we manage our workflow on our walls - for all to see. We communicate in an open forum, with daily stand-ups for 15 minutes every morning in front of our wall. We speak in turn about what we did yesterday, any blockers (ie things that stopped us from completing tasks), and what we plan to do today. This is the continuously iterative process known as agile delivery. The huge benefit of using the walls to track work is that everyone in the office can see what other teams are working on. This encourages open dialogue especially if it overlaps with your own work. Yes, we often use online tools to store information but we’ll always post this information on the wall. People are busy, so seeing progress at a glance is not just useful - it's of paramount importance. We'll be blogging much more about how we'll use agile methodologies for the HMRC transition, so watch this space. Over the last few weeks we've been busy recruiting. We now have three more content designers Andy Keen, Andy Harsant and Michael Nottingham, and a trainer Michael Brathwaite. You'll be hearing more from them on the blog over the coming weeks.